President’s Message | Uniting seven federations of the traditional mind sports : Chess, Bridge, Draughts, Go and Xiangqi with over 500 National Associations and close to one billion players. 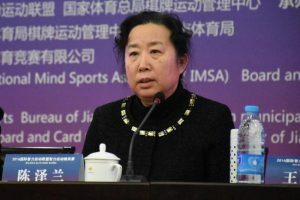 Since the change of the president of IMSA (International Mind Sports Association) in 2017, the organization has seen an increase from five members (Bridge, Chess, Draughts, Go and Xiangqi) to seven with the inclusion of Mahjong International League in 2017 and the Federation of Card Games in 2018. The IMSA leadership has been working very hard to introduce more multi-sport events in its calendar and two events are foreseen in 2019. The IMSA Master Games in May 2019 in Hengshui, and the 4th IMSA Elite Mind Games in Huaian. Both events are currently planned to be held in the People’s Republic of China which has fast become the intellectual capital of the world. Nevertheless, IMSA is currently holding discussions with Turkey and Saudi Arabia to investigate the possibility of organizing multi-sport events there also. Furthermore, IMSA is working on opening offices and training resources in Hainan province as this will give IMSA the opportunity to market and promote better mind sports throughout China and Asia. IMSA is also working currently on an intellectual index which will reflect the respective global strength of all countries in mind sports. IMSA has many challenges ahead of it but they are all positive and include firstly the expansion of the mind sports to encompass and assist other mind sports; secondly, to work with the International Olympic Committee in organizing and co-coordinating future IMSA events as well as the participation of all mind sports in the Olympic family and thirdly, to continue promoting skill sports with Governments all around the world. We are all writers of IMSA’s history, and I would like to express my heartfelt gratefulness to every supporter in the development process of IMSA.